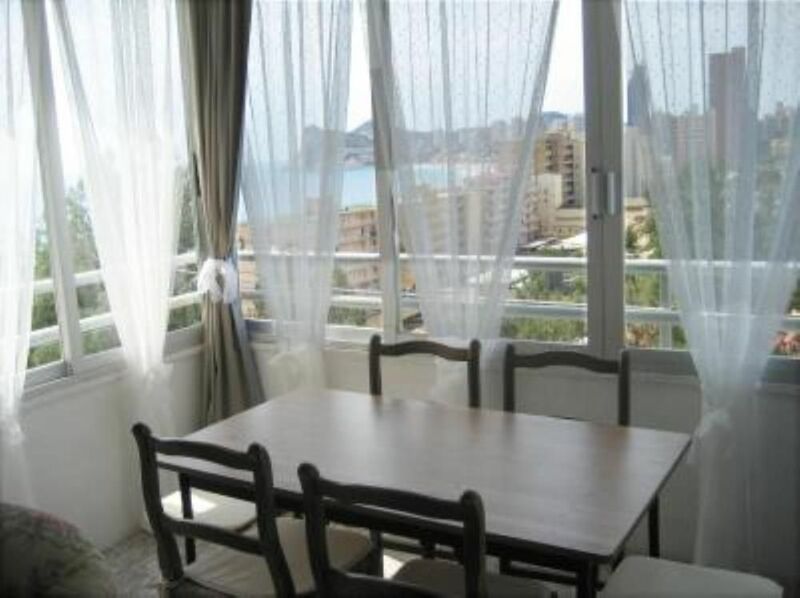 Very bright apartment very close to the beach (PONIENTE BEACH). A lift from the building take you to the beach. Excellent sights to the beach and mountain. Urbanization with gardens, supermarket, tennis court, sport field & swimming pool for adults & children. Main bedroom with sights to the beach and king size bed. Sitting room with closed terrace to enjoy the sun and the sights all the year. Had wonderful holiday in this appartment! What you see in pictures is exactly what you get! It is very clean with everything you need for a holiday appartment although it started to feel like home to my husband and i. Perfecly positioned for the beach and small spanish bars we like, and only a 15min walk into old town to our favourite Tapas bars and restaurants we frequent! So happy to have found this appartment and hope we can return again! Top marks to owner for getting it right! Thank you for your comment, much appreciated. "Lovely apartment very close to the beach, we had a fabulous time. The Old town is nice and quiet and the new promenade is beautiful, right across the road from the lift out of the apartment block. The apartment has everything you could need." Hemos estado 15 días. El apartamento es sencillo y acogedor, equipado con todo lo necesario. Las vistas están muy bien, se ve el mar y la playa desde el salón y desde la habitación principal. La urbanización es tranquila, muy limpia y cuidada, con una muy amplia zona para aparcar. Aunque durante nuestra estancia estaban cambiando el ascensor no se nos hizo pesado bajar hacía la playa. Tampoco se nos hizo largo el camino hacia el centro, está más cerca de lo que parece. En los alrededores hay tiendas y sitios para comer. El trato con Luis siempre ha sido cercano, amable y muy atento en todo momento. A nuestra llegada, que fue por la noche, nos recibió con estufas puestas por las diferentes estancias, ya que consideró que estaba frío el apartamento, un detalle que nos gustó mucho. Han sido unas vacaciones estupendas y tranquilas, nos encantaría repetir.